Saltwater Experience focuses on the inshore fishing lifestyle. Including fly-fishing and other shallow water fishing techniques. The hosts of Salwater Experience share their passion for their sport with the goal of continuing the tradition for future generations of anglers. Capt. Tom Rowland grew up in Chattanooga, TN where he developed a love for fishing while spending time with his father. The hours they spent together established a firm foundation for the passion that Tom now has for all types of fishing. While working in Yellowstone National Park, Tom was able to backpack every area of the vast Park and fish the wild backcountry streams. This adventure lead him to a career in guiding originating in Jackson Hole, WY. Second generation outfitter, Joe Bressler helped Tom learn the guiding business giving Tom a huge head start in achieving the level of success that accompanies him today. After 7 seasons as a drift boat guide on the greatest Western Rivers, Tom was ready to begin his saltwater career. Beginning in Key West, Tom spent a year learning the water before he ever took a paying customer. Artist Peter Corbin was Tom’s first paying customer and they enjoyed unbelievable success from the get go. On that fateful day, Peter landed 2 Permit on fly in a half day of fishing. Finding that accomplishment difficult to top, Tom worked hard on every charter and quickly developed a reputation of being a patient, extremely hard working and enthusiastic guide. This reputation spread like wildfire and soon Tom was booked constantly. After marrying the love of his life, Tom and Cynthia delivered two wonderful boys and a perfect little girl. Tom’s free time is devotedly spent with his family…sometimes fishing. Flyfishing has always been important to Tom and he has spent hours daily, perfecting his fly casting and teaching techniques. In Los Angeles, Tom recorded a 131 foot fly cast with a standard 5 weight fly line and 9 foot graphite fly rod. In 2000, Tom competed in the inaugural ESPN Great Outdoor Games in Lake Placid, NY and won two medals, a silver in the Fly Casting division and a Gold in the Overall. Since 1997, Tom Rowland’s tournament record includes more than 65 championships, divisional wins or top 5 finishes in international, national, regional and local tournaments for a wide variety of species. These wins come from fly fishing tournaments as well as conventional tackle tournaments in fresh and saltwater against an international field. The local tournament success lead Tom to try the national tournaments. The Redfish Tournaments were designed for a two man team. Tom had fished against Rich Tudor in numerous tournaments and respected his abilities. Together they formed a great team and a great friendship. Success followed and they gathered sponsors as quickly as they gathered tournament wins. The tournaments were a stepping stone to the television success they now have. 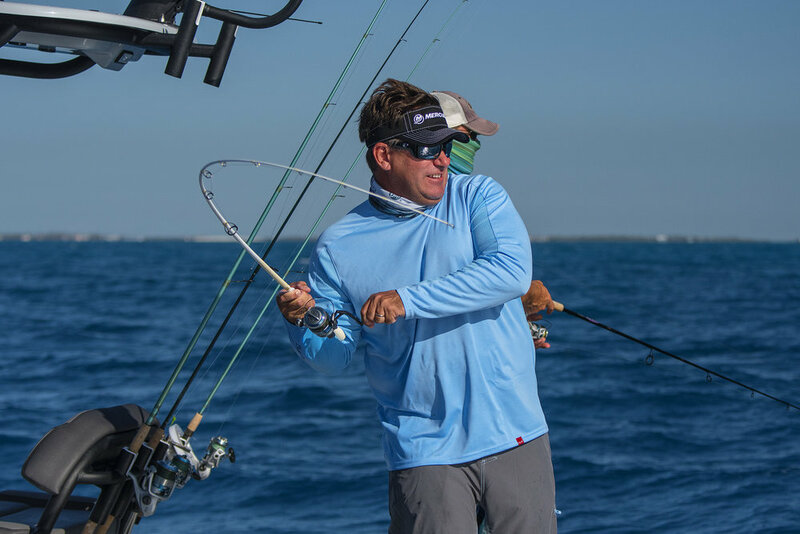 If his name or face is familiar, it may be because he has demonstrated at fishing shows around the country, published articles and photography in books and magazines and filmed more than 30 nationally televised fishing shows before creating Saltwater Experience. Capt. 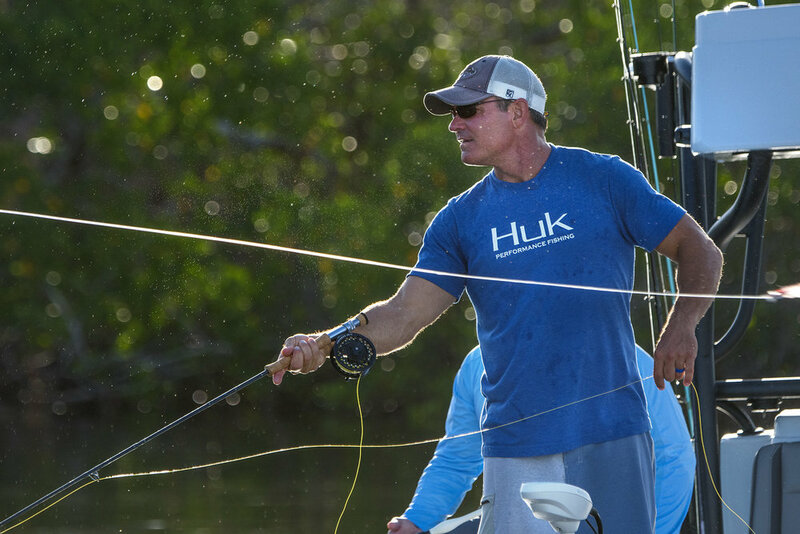 Rich Tudor grew up living and fishing in south Florida and the Florida Keys. He and his family lived and worked in Homestead, Florida, but they spent every free moment at their weekend home on Long Key. Fishing was a way of life in the Tudor home. Rich’s fondest memories are of spending time on the water with his mother and father. 50 tournament wins! Including a top ten finish in his first IFA Mercury Ranger Redfish Tournament. He has now teamed up with his top tournament rival, Capt. Tom Rowland. Together they have become one of top teams in the world of competitive inshore saltwater fishing. On January 2003, in there first IFA Mercury Ranger Redfish tournament together, they finished 2nd out of 125 professional teams. Their combination of professionalism and performance has made the one of most highly sponsored teams on the redfish tour.